Basements have a stereotype as being dark and dungy and typically are an afterthought when it comes to functionality and use. Being dug into the ground and usually with low ceilings, the basement is not the first choice as a place to retreat in your home. A walkout basement is where one side of the basement has access to the outdoors, this can make the basement more appealing, but often this only partly helps to alleviate the reaction of being “in the basement”. With our main living space making use of what is our “basement”, we wanted to ensure that there was no way that you felt the typical negative aspects of being buried in the ground. Two main design ideas were used to eliminate this feeling of basement “compression”, high spaces and access to light on more than one side. On this lower level of the house the ceilings are 10’ as opposed to the 8’ ceilings on the upper floor. In this way the house opens up more as you descend into the lower level. For light, providing large windows on the open end of the basement was the first step for providing good light but for the side that is buried below ground we made use of skylights from above to provide a wash of light across the back wall. I have been interested in the use of light wells and skylights for some time having experienced their use in other projects around the world. 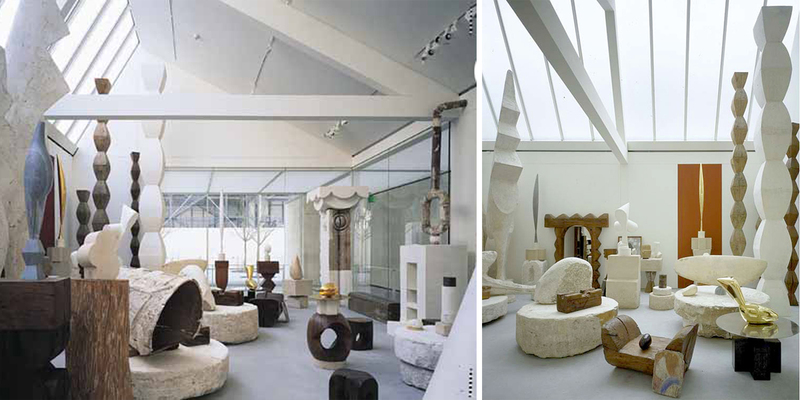 One project that I found exceptionally compelling is Renzo Piano’s Atelier Brancusi in Paris. The project was designed to house the works of Brancusi and it is meant to mimic the set up and quality of light that his original studio had. The majority of the space is top lit with a series of saw tooth clear story windows or skylights. I found the quality of light to be sublime and the work of Brancusi to be equally elevated by the quality of the light. This same effect is used in our home by using the northern light. The light quality is more subdued and consistent. A southern exposure would have heated the house to extreme temperatures in the summer months. I explored different expressions of the skylights through the exterior massing of the house in early design iterations but in the end I chose to simplify the roof and articulate the openings up to the skylights in a more dramatic approach.